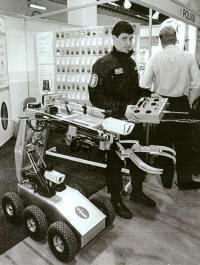 Bomb Disposal Robot - VANTEC control system. 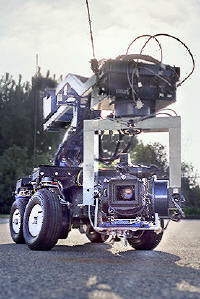 Paul Garin - 10 feet 4000 lbs of Fire Fighting /Waste Disposal Robot. Electro-hydraulically powered. 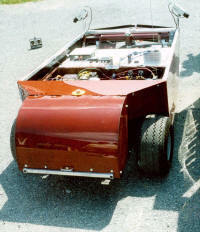 RDFR ran proportional hydraulics. 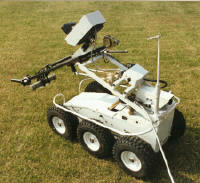 Experimental ordnance robot. Finland. KIK44 Control system.with RF power amp for necessary long range. Vantec RDFR ESCs..
Bertocchinni - BIOHAZARD. 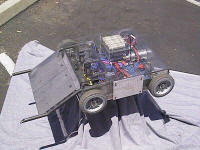 The winningest Battlebot ever, with RDFR controllers! A very early picture. Brull - Prometheous. Note blue RDFR along left edge of picture. Lisa Winters - Tentomushi. Used undersized RDFR with incredible effectiveness. Motor gearing was right! D.D- Team D "Our killer 55 lb. 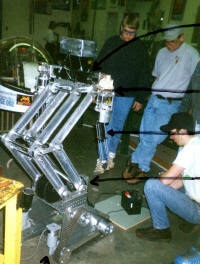 robot with a ... RDFR36E heart swept like a tornado through the BotBash 2000... and came in first..in class"
Gregory Yabkowski - Team Mad Cow. Check out the blue RDFR mid-pix. D.D " NO problems with our two 36E controllers! ...won three fights in the superheavies (using) 10 1/2hp drill motors." Robert Pitzer - Alpha Raptor. " 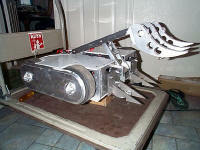 performed awesome and so did it's RDFR33 even though.. thrown... by the BattleBox saws." RC Armory - note blue RDFR22 speed control in upper right. 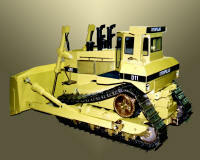 D11 Catapillar model using RDFR Dual speed control. By H.Baily, MA. JNT - Peter Jensen, Hollywood, CA. Moving Picture Camera Dolly. An R/C grip! Uses RBSA and RDFR controls. Terry Coss - Newburg High School, OR. 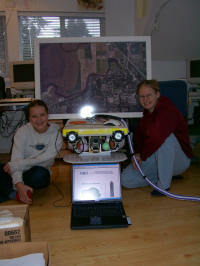 They have been takling a new robot project every couple of years and winning educational fares. 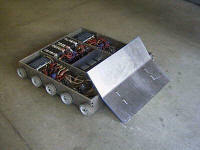 R/C designs have used Vantec Keykoder radio and RDFR speed controls. 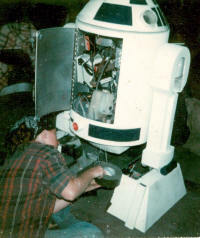 One of the many garage hobby R2D2. Old Vantec DFRM controls.